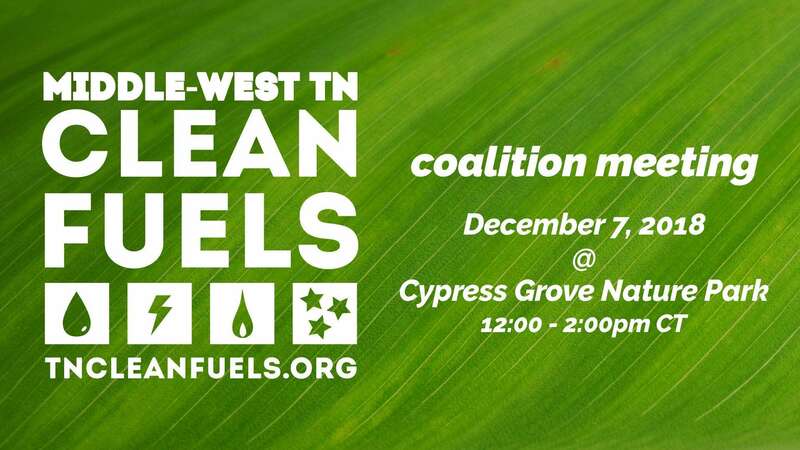 Please join us for our Fall 2018 Middle-West Tennessee Clean Fuels Coalition meeting in Jackson, TN! We’ll discuss a number of grants (VW, CMAQ, other potential grants), fuels and opportunities, and we will have several speakers from fleets across Middle and West Tennessee who utilize alternative fuels. During this meeting, we will highlight the expected timeline for project solicitations under the Volkswagen Diesel Settlement, as well as the related rollout for other, similar funding opportunities. We will highlight recent initiatives occurring in the Middle-West TN region (e.g., SmartCharge Nashville, Drive Electric TN, etc. ), will touch on upcoming events, and will also provide an overview of this year’s Sustainable Transportation Award winners. Lastly, several speakers from fleets across Middle and West Tennessee will highlight some of their success stories with alternative fuels and advanced vehicle technologies. There is a tentative tour of the Waste Management CNG refueling facility scheduled for after the meeting. This coalition meeting will occur from 12:00 pm-2:00 pm on December 7, 2018, at Cypress Grove Nature Park in Jackson, TN (866 Airways Blvd.). There’s no need to print your ticket and bring it to the meeting, but you do need to RSVP so we know you’re coming. Please register for the coalition meeting by Monday, December 3rd. You can register on our Eventbrite page now! We’ll see you there.